From Dust I Will Return. | Do. Be. Interesting. Home Adventure From Dust I Will Return. From Dust I Will Return. What to do now that the Happy Hive is closed and my return flight isn’t for another 3 weeks? The suggestion I get most is to do some touristy stuff around the island. The thing is, I’ve been really challenged here, wracking my brain day and night for ideas to make Team Happy and the Happy Hive a success. And now I’m supposed to wander around with tourists snapping pictures I can find on the Internet? If you’ve seen one limestone building, you’ve seen them all. And if you’ve seen one limestone building, a stray cat, some scrub brush, and a cliff overlooking a turquoise sea, you’ve seen all of Malta. I’m getting back to work on my apps and keeping an eye open for the next grand adventure. Last night a few of us were hanging out after spending the day cleaning in futility. Earlier in the day, I thought someone was coming to potentially take over the Happy Hive lease and get some photos of the place. After a day of cleaning, complete with brownies baking in the oven to make it smell nice, a guy shows up and says he’s here to get a photo of the place to post on a web site. And he wants one of the outside of the building. So we were watching “The Martian” with Matt Damon stranded on a dusty red planet. And it was really dusty. As in, the whole place smelled and tasted like dust. I was pretty sure I was imagining it, or that maybe it was just a little extra limestone dust from the walls. I’ve always found it incredible that this place is still standing, as old as it is, given the rate at which the walls crumble every day. No matter how often you sweep, there’s always a pile of limestone powder at the base of the walls. The stones are really thick, but that has to take its toll eventually, right? Then someone else commented on the dust. 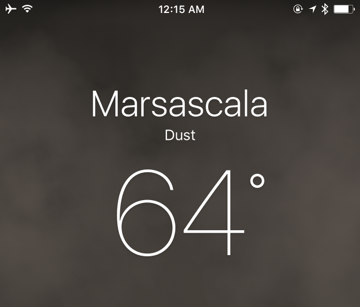 And noticed that the iPhone weather app simply said “Dust”. Sure enough, when we looked outside there was an entire storm of dust blowing at gale force. It’s still blowing the next day and everything is coated in a layer of dust. Previous articleThe Happy Business Plan. Next articleCelebration of the Macabre.